Crowns and Bridges are common tools used to help restore strength to teeth that have become weakened or to help bridge gaps that might appear in your smile. Sometimes our teeth just weaken over time, and they can’t seem to handle what we used to throw at them quite as well. If that’s the case, crowns and Bridges can be the perfect solution to restore your smile. Crowns are tooth shaped covers that fit over the existing structure of your natural teeth, protecting and restoring the tooth’s natural function. However, it is also common to use a crown for more aesthetic reasons. These can include utilising a crown to bring a more natural looking shape to your tooth, or to fill small gaps that can commonly occur. Crowns can even be used to bring a more natural looking shade of colour to your teeth to help them fit in a little more naturally with your smile. Our dental technician handcrafts each crown individually to ensure you receive a healthy and natural look for your smile. Bridges are quite similar to crowns; however, they are used to replace an entire tooth rather than just a portion like a crown would. 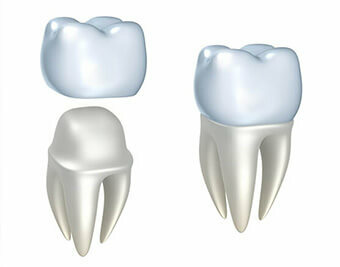 These are permanent fixtures that are anchored to nearby natural teeth. These natural looking replacements therefore create a “bridge” between your two nearest natural teeth. Bridges are full, single-tooth replacements that also help prevent your natural teeth from drifting into the gap created by the missing tooth. Each piece is customised to ensure you receive a healthy and natural fit that also matches comfortably with your bite. If you find your smile being compromised by any unsightly gaps, missing or damaged teeth, a crown or a bridge could be the perfect solution to help restore your naturally beautiful smile. Don’t hesitate to contact us at (03) 9395 8400 our friendly dentists in Point Cook to discuss your treatment options and solutions today!